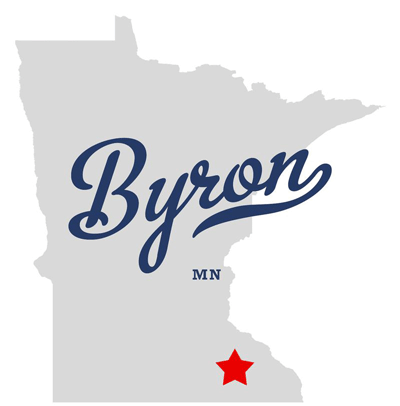 Located just five miles west of Rochester in Olmsted County is the city of Byron, MN. As a small, rural city, Byron has its roots in the farming industry but is also the home to many Mayo Clinic employees and their families – and many business owners including Jeremy and Jeana Babcock and their family. Byron has grown year over year and is now the home to over 5,400 people. A majority of these residents work in Rochester, commuting the short distance daily from the peaceful country and small-town setting of Byron. Although Byron's residents can easily enjoy the benefits of a nearby larger city, a few local services and an excellent school system (Go Byron Bears!) highlight the town. For leisure, Somerby Golf Club and Community is a private golf club close to the city center of Byron, and Oxbow Park and Zollman Zoo are found just to the north.